There are a few theories on this, and many would argue that the answer is not cut and dry. The recommendations on when to start solid foods have changed drastically over the years. 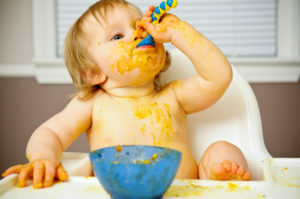 However, what's … [Read more...] about When Should I Introduce My Baby To Solid Foods? Hi Everyone! I've had a lot of questions recently about how to introduce solids. I thought that I would share a recent article that I wrote for Birth of a Mother Magazine on this subject. I've been … [Read more...] about Introducing Your Baby to Solid Foods!